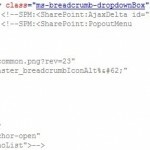 In SharePoint 2013 the breadcrumb has been hidden from the Seattle master page. If, like me, you miss this functionality and want to enable it again just follow these steps: 1. Launch SharePoint Designer 2013 and open your site 2….